Each camping season we expect all campsites to be cleaned by May 15th. If your campsite is not cleaned by May 15st you will be charged $150.00 and we will clean it. When you have finished cleaning your campsite let us know by signing the sheet in the office so that you will not be fined. During the camping season you are responsible and expected to keep your campsite neat and clean at all times. Failure to keep your campsite clean could result in extra clean up fines, or being asked to vacate the premises. That decision is determined by management. Please inform the office if you are unable to clean your campsite. We have people available to help you for a reasonable fee. When cleaning your campsite, put leaves in the appropriate dumping pit. 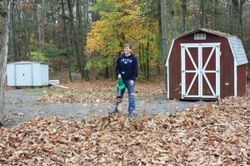 DO NOT blow your leaves onto other campsites. NO BAGS are to be put into leaf pit. Make sure your leaves are removed past the water lines so that it will be easier to find leaks in the line. ABSOLUTELY no picking up or moving of the water lines. No outside refrigerators, unless in a shed. Only one unit or tent per campsite. Cleaning camper: You are expected to clean your camper at least once per camping season. Notify the office when it has been washed. Please inform the office if you are unable to clean your camper. We have people available to help you for a reasonable fee. Campfires: Absolutely no unattended campfires. Campfires must be extinguished before leaving campsite or going to bed. Absolutely no tree cutting or use of chain saw without approval from management first. New structures/Repairs: No electrical work is to be done by outside vendors. Please report any problems to the office and we will get it fixed. No wooden porch roofs or other wooden attachments allowed on campers. Buildings, tents, or structures of any kind are not to be erected without prior permission. If you are bringing in a shed it must be put at a location approved by management.